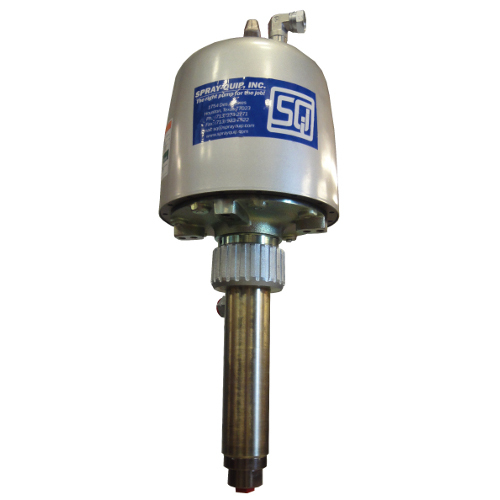 Graco Bulldog Pump for Blow-Out Preventers | Spray Quip, Inc. The production segment of the petroleum industry depends greatly on Blow-Out Preventers (BOP) to mitigate safety hazards, environmental contamination and lost crude oil product & production, due to oil well accidents. The Graco Bulldog 43:1 power ratio pump is the original and dependable, specifically engineered pump for supplying hydraulic oil to the accumulators on BOPs. The Bulldog pump supplies hydraulic oil at the higher pressures & cycle rates required to operate the hydraulic crimping tool that crimps off the production pipe to stop the flow of crude. The Graco engineered Bulldog hydraulic oil pump has been the preferred and specified device for over 25 years, with 100s of these pumps installed on BOPs throughout the world, because of its robust yet simple design & construction, compressed air efficiency and reliable operation. Adaptability & Efficiency - The Bulldog pump’s size & configuration allows for easy drop-in installation on most BOPs, while providing the largest volume of hydraulic oil for a given amount of compressed air. Robust Design & Construction - The packing design is self-adjusting to compensate for wear. The pump has rugged check valves & seats, hardened stainless steel balls for long life. Both the cylinder and piston rod are chrome-plated for protection from wear and corrosion. Other exposed parts needing protection are nickel plated. Integrated Silencer - The pump has an integrated silencer and quieter than most other air operated pumps and provisions exist for connection to an exhaust manifold if required. Easy Field Service - Each pump includes an easy to follow service manual and nearly every maintenance & repair procedure can be accomplished in the field with simple tools normally on-hand. These pumps and service parts are available from Spray-Quip, Inc., a Graco, Inc. Top 20 Full Service, Stocking Distributor.